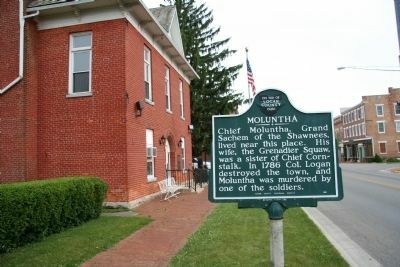 Chief Moluntha, Grand Sachem of the Shawnees, lived near this place. His wife, the Grenadier Squaw, was a sister of Chief Cornstalk. In 1786 Col. Logan destroyed the town, and Moluntha was murdered by one of the soldiers. Erected 1951 by Logan County Historical Society. Location. 40° 15.221′ N, 83° 45.352′ W. Marker is in West Liberty, Ohio, in Logan County. Marker is on North Detroit Street (U.S. 68) just north of Columbus Street, on the left when traveling south. Touch for map. When traveling through West Liberty, Ohio on US 68 (Detroit Street) one will find that this historical marker is located on the Detroit Street side of the West Liberty town hall building. Marker is in this post office area: West Liberty OH 43357, United States of America. Touch for directions. View of historical marker with West Liberty's municipal building in the left background. (about 800 feet away); West Liberty / Glover Hall (approx. 0.2 miles away); Michael Lane Partin (approx. 0.3 miles away); West Liberty Veterans Memorial (approx. 0.4 miles away); West Liberty Lion's Club Park (approx. half a mile away). Touch for a list and map of all markers in West Liberty. 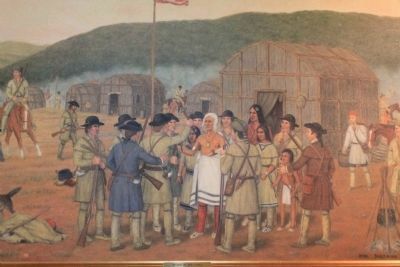 View of a painting showing the murder of the Shawnee chief Moluntha. This painting is on display in the Logan County Historical Museum, in Bellefontaine, Ohio. Miami River valley against the Shawnee villages as a diversionary strike. These thrusts into Indian lands were to take place at the same time. "Colonel Logan assembled approximately 800 militia troops at Limestone (Maysville). They crossed the Ohio River in the last days of September and moved north. They moved almost directly north from Limestone to the Shawnee village of Mackachack on the upper Mad River. Mackachack was located near the present-day town of West Liberty, Ohio. Logan's army arrived in the vicinity of Mackachack around noon on the 6th day of October. He had organized his troops into three columns. The left column was ordered to attack a smaller Indian village on the west bank of the Mad River opposite Mackachack. The center and right wing would attack Mackachack proper. The order was given, and the army charged quickly toward their objectives. "Most of the Shawnee warriors were attending that large assembly of Indians that caused the great concern of General Clark. Therefore, they were not present to defend their own villages when Colonel Logan's attack occurred. Logan easily overran Mackachack and captured a number of prisoners. Logan's men then proceeded to attack and destroy several other Shawnee villages that were nearby. "The assault against the Shawnee villages by Logan's men continued for two days. Wapatomica, located about four miles east-southeast of the present-day city of Bellefontaine, Ohio and Wapakoneta, Ohio,were among those villages that were destroyed by Logan's army. At a cost of three men killed and three others wounded, Colonel Logan's raiders then reassembled for their withdrawal. They had killed 22 Indians, captured 33 prisoners who were mostly women, destroyed more than 8 villages, and burned a large amount of foodstuffs and fields of crops. Several of the Indian casualties, however, may be more accurately characterized as murder. 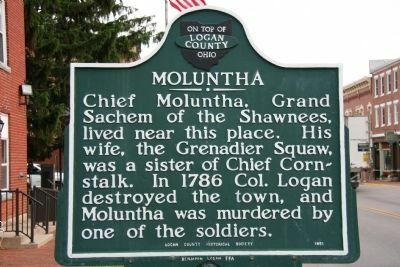 For example, an old Shawnee chief by the name of Moluntha was killed by a member of Logan's army after the old chief had surrendered. The killer was a survivor of that ambush at Blue Licks which occurred more than four years ago, but he killed Chief Moluntha in revenge for that long ago disaster. "On 8 October, Logan issued the order to withdraw back to Limestone. They arrived at the Ohio River in less than a week, and there the army disbanded. The raid on Mackachack was considered quite successful when compared to General Clark's main raid up the Wabash. Clark's army progressed only part way to their destination before supply problems, desertion problems, discipline problems, and other problems forced the General to withdraw back to Louisville without making any attack. "In some respects, Logan's raid on Mackachack and the other Shawnee villages had the opposite effect than that desired. In addition to being considered a retaliatory strike, many Americans had expected the raid would also intimidate the Shawnee and perhaps bring an end to the Indian raids on their settlements. But rather than intimidate, the raid caused the various groups of the Shawnee Tribe to join forces. They then became more aggressive and posed a greater threat to the American settlements than before Logan's raid. Life on the American frontier continued, then, to be quite a challenge for the Americans." — Submitted June 19, 2009, by Mark Bushong of Prospect, Ohio. More. Search the internet for Moluntha. Credits. This page was last revised on June 16, 2016. This page originally submitted on June 15, 2009, by Dale K. Benington of Toledo, Ohio. This page has been viewed 1,717 times since then and 36 times this year. Last updated on June 20, 2009, by Mark Bushong of Prospect, Ohio. Photos: 1, 2. submitted on June 15, 2009, by Dale K. Benington of Toledo, Ohio. 3. submitted on August 24, 2012, by Dale K. Benington of Toledo, Ohio. • Craig Swain was the editor who published this page.